Zeldie, my mostly companion is at the Vet's today. We took her in yesterday after she had refused to eat. She will be re-hydrated and then evaluated using lab work. The vet is thinking that she may have kidney disease, as she couldn't find anything else to account for her refusing to eat or drink. 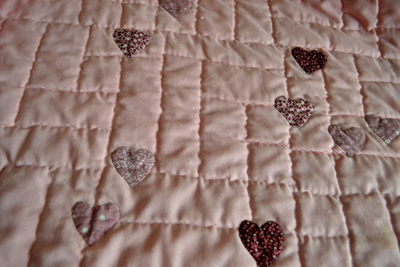 I take her for granted, though even yesterday, I was mending a new quilt that she had decided to revise with her teeth. 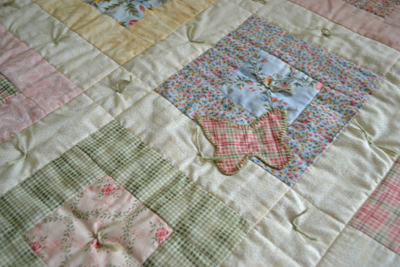 I decided that since this quilt reminded me of a flower garden, I would patch Zeldie's teeth holes with appliqued butterflies. I think she just likes to add to the designs of my quilts. 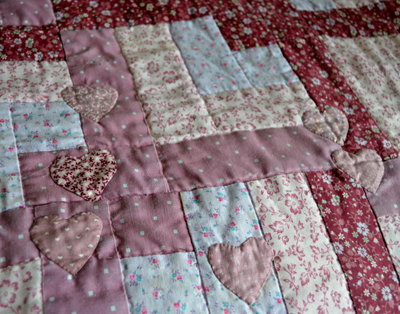 Our other patched quilt is patched with hearts and as one can clearly see, this is a quilt much loved by my Zeldie. I vowed I would not own a destructive cat, but there is the rub. I don't own her, she owns me and my heart. I have rearranged the entire house for my little Zeldie...Every overstuffed piece of furniture is now covered with soft blankets that she mostly kneads instead of bites, though she still nibbles at them as well...so much for my last word on anything. 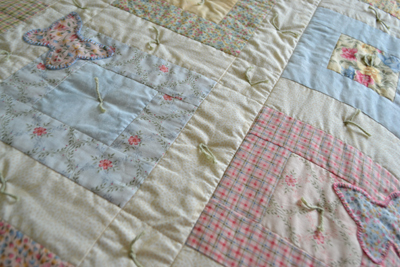 I choose not to use my mother's precious quilts as my mother's quilts are not in need of being redesigned!! My quilts are not in that category however!! We just got a call to pick her up and take her back home. It is for her own comfort and our finances. We are to feed her baby food and give her antibiotics for now and offer water to her, and we will know more tomorrow. 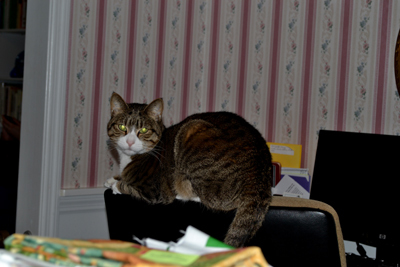 She is still very droopy looking and sleeping in her favorite place, on the back of my vacation chair. I may need to learn to give her fluids subcutaneously. Sometimes cats can live on with their kidney issues, though there is much to consider. I pray that my little Zeldie is simply acutely ill and will get better! I miss "my mostly companion" and hate seeing her not feeling well!! Labels: aging cat, cat with health issues.